We’ve been waiting and waiting. Waiting and waiting and waiting. Since 2009 to be precise, when word first spread about that band that sounded like Huggy Bear with the rawness of Bratmobile … but with Essex accents. 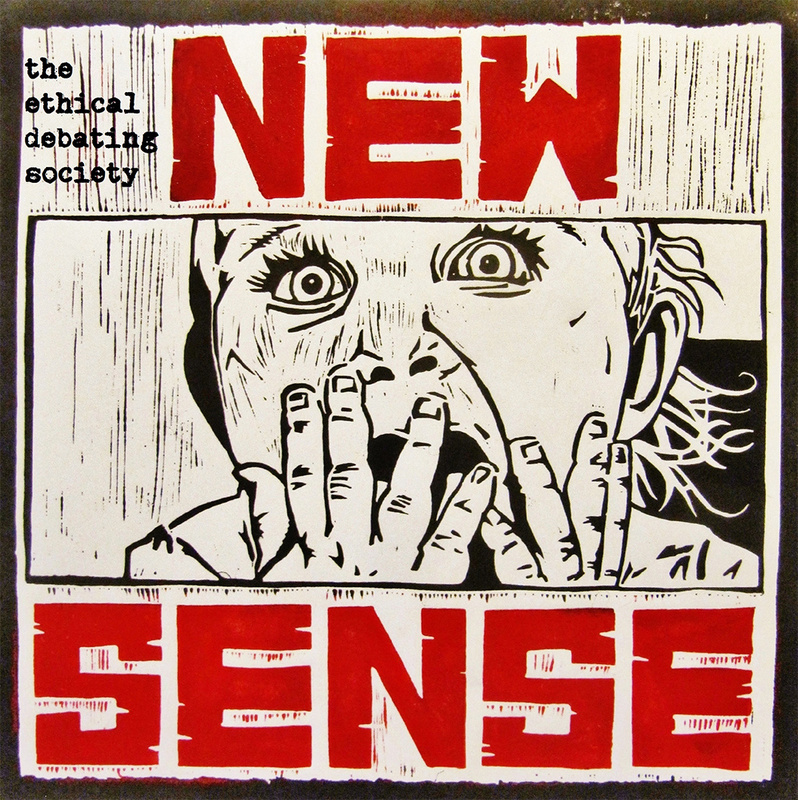 We’ve been waiting for The Ethical Debating Society to release an album and take the crown that they clearly deserve. Obviously other things got in the way, there were a few line up changes along the way, but The Ethical Debating Society (or TEDs as they’re affectionately known by their fans) finally released their long awaited debut album and its definitely worth the wait. TEDs are Tegan on guitar and vocals, Kris on guitar and vocals and Eli on Drums. In the run up to their debut, TEDs released Hens Teeth on Tuff Enuff Records, a collection of demos that we reviewed on this very site. New Sense, released on Odd Box Records, is a full on mix of the best of TEDs wide catalogue; everything to treat fans old and new. Recorded at Sound Savers studio in Homerton, London, the album captures what TEDs do best; have discussions on class politics, and feminism and play very, very loudly. It is rare to hear a band captured in their raw, natural state without the frills and polish that are usually added in. Given TEDs DIY politics, it makes perfect sense that they chose this sound. The album opens a little apprehensively with firm live favourite ‘Child’s Play’. At TEDs live gigs Tegan regularly calls everyone in the audience to start a band whether they loved TEDs or not. The little blip at the beginning could be TEDs way of letting us know that there’s no such thing as the perfect band and if they can do it then so can everyone else. While this is their debut album the band has re-recorded new versions of previously released songs such as ‘Future Imperfect’, ‘Creosote Ideas’ and ‘Hobson’s Choice’. Kris and Tegan’s vocals, while on first listen sound like polar opposites, compliment each other perfectly. Tegan’s well directed scream acts as a perfect addition to Kris’ sneering vocals. TEDs are at their best when they’re having fun of course and ‘Exxxtreme Vintage’ is a good example of this very fact. Tegan jokes around and sends up those very particular types of hipsters that wander around Dalston in a daze: “check out my mates don’t you know they all live in a warehouse”. There are influences that seem obvious listening to the album that I never particularly heard listening to the band live such as the homage to mid 90s Britpop style. I have Pulp or maybe even Kenickie in mind but maybe I’m just getting carried away. Standout tracks include ‘Future Imperfect’, ‘Exxxtreme Vintage’, ‘Razor Party’ and ‘Sum of my Parts’. Album closer ‘Disasters I’ve Known and Loved’ is a bare a capella number that showcases a different side of Tegan’s voice. Short but sweet, the song is a beautiful but unexpected way to close an album that was otherwise a raucous noisefest. New Sense is years in the making and worth every second it took to get together. It looks like TEDs DIY outlook has paid off. Everyone can start a band and if they do they can hold up New Sense as the goal post for the perfect DIY album. So what you waiting for? You know three chords right; go use ’em. Tags: album, diy punk, eli, Featured, hen's teeth, kris, london, new sense, odd box records, riot grrrl, teds, tegan, the ethical debating society, tuff enuff records. Bookmark the permalink.